This hero's last stand did little damage to his enemies, but he is definitely still worthy of our respect. The year was 1798, Napoleon Bonaparte was doing his thing for the French. Despite his success, he could not keep a safe distance from the British Royal Navy. He was concerned so much with Admiral Nelson, of the Royal Navy, learning of his location that he swore everyone around him to complete secrecy. That July, Napoleon and his fleet set anchor in Aboukir Bay at the mouth of the Nile in Egypt. He had been planning to invade Egypt and shut down the British/Indian trade. What he didn't know was that Admiral Nelson was in hot pursuit and dying for the chance to have a crack at Napoleon’s fleet. On August 1, Admiral Nelson found the fleet anchored and ill prepared for battle. 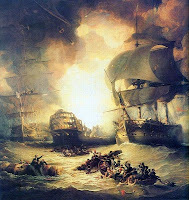 In a daring move, Nelson positioned the Royal Navy's ships on both sides of the French fleet. They effectively cut the French fleet off from the shore and prevented them from fleeing out to sea. Once in place the British opened fire. A bloody battle ensued. One ship, the L'Orient caught fire. As the flames raged on, the sailors abandoned their ship quickly. The other surrounding French ships tried to distance themselves from the burning L'Orient. It was only a matter of time before the flames reach the ship's magazine...which meant bang! Despite all the chaos of the battle, one lone figure was spotted on the deck of the L'Orient. It was a twelve year old boy named Giocante Casabianca. He was the son of Lois de Casabianca, Captain of the L'Orient. It is said that the boy had been given his post on the deck of the ship and was not going to leave his duty until told otherwise by his Commanding Officer (his father). We can assume that his father was dead or injured. But the boy did not panic. He stood calm, strong and fearless on the deck of a ticking time bomb. When the flames finally reached the magazine, it exploded with such tremendous force it could be heard from miles away.